4 Peaks Music Festival returns to beautiful Bend, Oregon this year for the eleventh time. 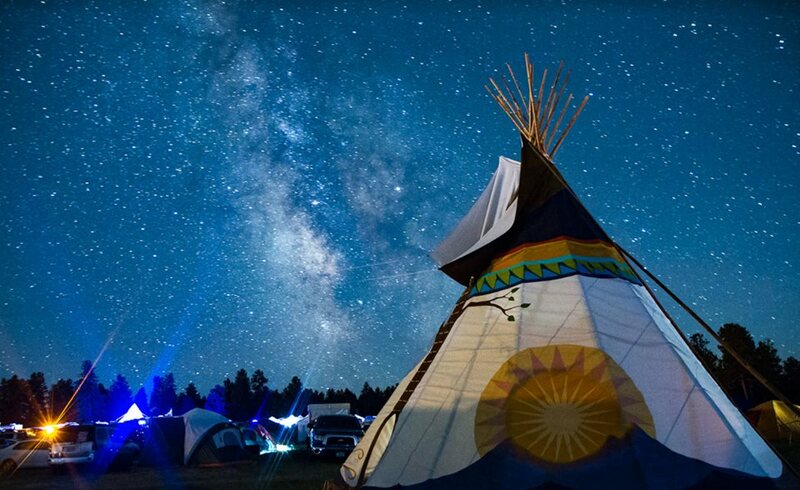 Beginning June 21, experience four days of music and camping amongst central Oregon’s high desert with a line up that includes Greensky Bluegrass, Nahko & Medicine for the People, The New Mastersounds, and more. Always known for the views, hence the name, 4 Peaks will be spending its second year at its new home, Stevenson Ranch. Expect the festival to utilize these gorgeous grounds even more so the second time around. One new improvement to the grounds is a greater emphasis on “The Junction.” The Junction is an area dedicated for late night pickin’ that went largely unnoticed last year so the festival responded by adding tipis, games, food, coffee, and tea vendors to the area for 2018. Also improved is a newly expanded “Kidlandia” area and a Deschutes Brewing / Cascade Alchemy Bar pouring plenty of tasty beverages. As usual with 4 Peaks, Thursday is a mellow entry day, allowing you to ease into the festival and get your camp set up before heading to the Lava Rock Stage to catch Particle at 8:00 PM. It’ll be the east coast jamtronica pioneer’s first time at 4 Peaks and their addition marks a welcomed shift toward a more diverse line up at the festival which also includes Yak Attack, a rapidly rising jamtronica trio from Portland. Friday morning, just like the rest of the weekend at 4 Peaks, starts off with a 9:00 AM yoga session with Nicole Baumann. Grant Farm guitarist and national flatpicking champion, Tyler Grant, will then open up the Cascade Mountain Stage for the weekend with a noon set that is part-Grant Farm, part-superjam. Following Grant on the Cascade stage is the reigning IBMA Guitar Player of the Year, Molly Tuttle, the first woman to win the prestigious bluegrass award. Things get rockin’ from there as Scott Pemberton, North Mississippi All-Stars, and Steve Kimock Band bring us into the evening before Nahko & Medicine for the People close out the Cascade stage for the night. Host band Poor Man’s Whiskey plays their first set of the weekend in the tent (Lava stage) that will go until curfew says they can’t play anymore, at which point the party people have two choices; put on a pair of silent disco headphones or head down to “The Junction” and get weird in the campgrounds. Saturday’s music begins with Cascade Crescendo, a burgeoning string band from Portland. You’ll want to get your rest and eat your wheaties because it won’t let up from there. The Mother Hips, Mojo Green, Yak Attack, another Poor Man’s Whiskey set, and England’s funkiest four-piece, The New Mastersounds, bring us through the afternoon and into the evening. Two hours of Greensky Bluegrass under Andrew Lincoln’s stunning light show then closes out the night on the Cascade stage before two more hours of hot pickin’ ensues in the tent, this time at the hands of The Brothers Comatose. Sunday at 4 Peaks remains mellow as well, with music ending at 4:00 PM and plenty of time to casually pack up camp and get back to where you came from. Bend’s child prodigy, Maxwell Friedman, plays with his Maxwell Friedman Group in the morning, bookended by two of Blackstrap Bluegrass’s three Sunday sets. Another Tyler Grant & “Farmily” superjam then closes out the weekend and everyone goes home happy, sunburnt and exhausted.